Oslo, April 19th, 2017 – Acon Digital updates their award winning Restoration Suite for audio restoration work to version 1.8. Restoration Suite consists of four powerful tools for audio restoration work – DeNoise, DeHum, DeClick and DeClip. 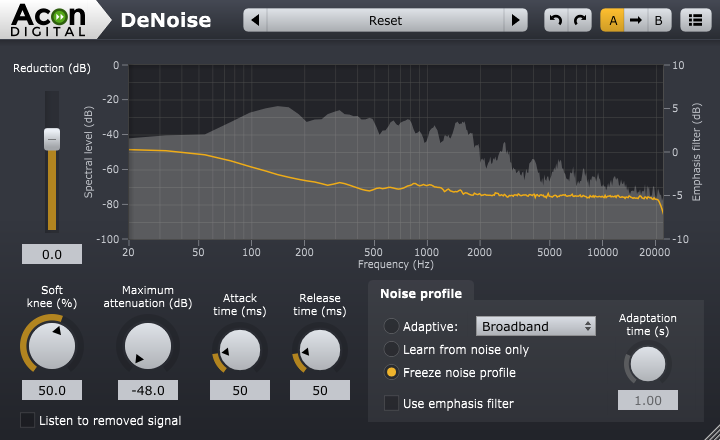 The focus in version 1.8 is DeNoise which has received several quality improvements. A new soft knee parameter allows for more natural transitions between noise and the wanted signal. It is in most situations desirable to leave a certain noise floor in the restored signal and it is easier to achieve a natural sounding residual noise with the new update. Furthermore, the attack and release times are now adaptive and automatically adjusted according to the input material. The controls are still there, but these are now representing the maximum attack and release times. The noise profile estimation in the adaptive broadband noise mode is now capable of a better discrimination between noise and the wanted signal. Acon Digital Restoration Suite is available for both Windows (PC) and OS X (Macintosh) for $99.90 (USD) at acondigital.com. The plug-in formats VST, VST3, AAX and AU (OS X only) are supported. The update is free for all Restoration Suite customers. Copyright © 2017 Acon AS. All Rights Reserved.